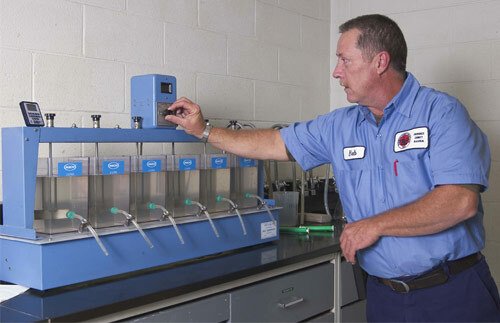 Jar testing is an integral part of the water treatment process. There are few jobs more important in the protection of public and private water and wastewater treatment systems than the Water Operator and Wastewater Operator. These positions are the backbone of the water supply and wastewater industries. Becoming an operator is an attainable goal for men and women who meet basic requirements and qualifications. Each career path offers an entry level position typically called Operator-In-Training which requires minimal skills and experience. Those who are hired as a trainee must complete a probationary period ranging from 3 months to 1 year. Upon successful completion, the trainee is promoted to the next level. Water Operator jobs require knowledge of electronic equipment and how to interpret and store the data collected during water treatment and distribution. Operators are expected to understand inventory management regarding the chemicals used during water treatment as well as fuel and supplies. Operators must know how to generate reports based upon routine operations, and understand current technology in water treatment, distribution and water quality. Operators should have working knowledge of water treatment plant maintenance and the safety regulations that pertain to the work. In some cases, they must know how to service the equipment that treats the water which can include calibration and repairs. Employees should be familiar with standardized water quality tests and state and federal regulations that apply to that particular system. Water Operators must be able to manage and operate water treatment system equipment including automatic control devices. They typically are responsible for repairing and calibrating plant equipment. Most employers expect water operators to be able to work without immediate or detailed supervision. Entry level positions in Water Operations or Wastewater Operations typically require only a high school diploma, however organizations prefer applicants have some level of higher education. A college degree will be beneficial for promotional opportunities in either career path—especially for positions like manager/supervisor or an executive management position in the water/wastewater industry. Most operator jobs in the water and wastewater industries require employees to be certified for work within facilities of different sizes and types. Each state is responsible for maintaining a certification program for water and wastewater system operations. Certification levels and types differ from state to state, but they do share similarities in their requirements. The Environmental Protection Agency (EPA) provides a summary of state certifications. 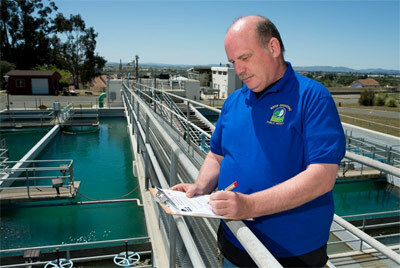 A senior operator surveys water quality. In California, distribution systems are classified as D1 to D5 based on two factors: complexity of the system and population in the service area. Treatment systems are classified by three factors: treatment techniques, source water characteristics, and system capacity. Employees must meet the criteria to be certified for work in each of these classifications. In some cases, job applicants will be hired as a water operator or treatment plant operator with the expectation they apply for and receive the required certification at a certain point during their employment.